My Dream Wedding have recently branched out into wedding decor and we are very excited to say the least. 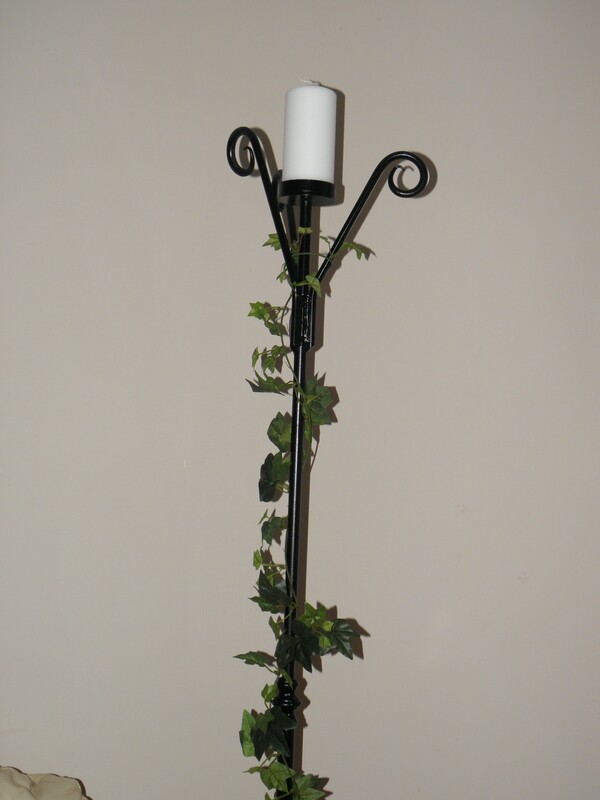 Our first venture is candlelight packages for both church & civil ceremonies. Candlelight ceremonies are growing more popular as they are a fantastic pocket friendly way to create and intimate atmosphere. 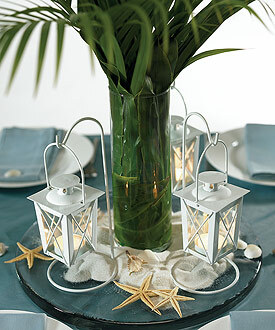 If you are looking for a warm romantic ambience then a candlelight package is the way to go. Suitable for both church & civil venues My Dream Wedding are offering some incredible budget friendly packages. What should I look for when buying a Ring? How do I choose a Diamond? We are all told about the four C’s when choosing a Diamond, but what does this mean? What does Carat mean? What are Colour and Clarity, and what about Cut? Of the four Cs which determine quality, diamond cut is the most important characteristic in choosing a diamond. The cut refers to the diamond’s proportions and symmetry. The combination of these factors, together with the polish and overall finish is known as the cut of the diamond. The cut of a diamond is often related to the final diamond shape, but not always. If a diamond is cut too shallow, light can escape from underneath, reducing the brilliance. If the cut is too deep, light can spread out from the sides, again affecting the sparkle. A diamond with good proportions will allow the light to travel inside the diamond, reflecting the light through the table and crown (the area below the table, which usually tapers out to the widest point on a Diamond) for maximum sparkle. The Carat is the weight of the Diamond. Not the actual dimension size. All factors being equal, a larger diamond will cost more per carat than a smaller diamond because it is rarer. Two half carat diamonds will typically cost less together than a single one carat diamond. A four carat diamond will cost more than four times the price of a two carat diamond of the same quality. The Colour is pretty explanatory. Diamonds start on a scale from D, E, F downwards. Think D for Diamond. A D Coloured Diamond is in itself colourless to the naked eye. Unless you are a diamond expert you will probably not be able to tell the difference between diamonds which are colour graded D–I unless you are comparing diamonds side by side. A diamond clarity grade is a measure of how free the diamond is from internal inclusions (imperfections), or external blemishes (marks of various kinds). Diamonds which have no inclusions or blemishes are incredibly rare in nature. Most diamonds have flaws which cannot be seen except using 10 x magnification – which is how diamonds are graded. Such flaws do not affect the beauty of the diamond. Why do I need to know about this? Can I not just buy the biggest I can afford? Of course if you want to. But as I said it is weight, not size that you should be looking for. And an ideal cut if possible. This is what will make your Diamond sparkle like a star, no matter what the size. When choosing a ring, I have told clients that it is best to take your time, and try on as many different styles as they like. In fact you should go to as many Jewellers as you like, some may suit, some may not, and importantly the dream ring you always wanted, may not look as good as it did in the magazine. Ladies your hands are all different in shape and size, so see which Ring appeals most to you. You will have that ‘Eureka’ moment, and you can go from there. Again the simple answer is what ‘can’ you afford. There are myths, and notions that you should pay so much. Realistically you should set your budget, and stick to it. If you don’t find the right Ring for the right price in one Jeweller, then search further afield. We are a nation of consumers; we have so many stores and shops on our door steps. So use them. Do not be intimidated by walking into a Jewellers and asking to try on their goods. We do it with shoes, clothes etc, and this is no different. In fact it is more important. It changes your whole life. Be in charge. Where will I get the best deal? A lot of people are searching for alternatives, and as with my advice above, here is what you should know. Buying Online. You’ve seen the ring of your dreams, at a considerable saving. Should you go for it? If as I said, you have done your homework, and are happy that after customs duties and V.A.T you are indeed making a saving, then it is a possibility. It is not something I would be comfortable with, considering the decisions you have to make. Buying Abroad. Yes there are some bargains to be had, but along with that comes the horror stories. Be wary of buying in some foreign countries. The grades of stones may or may not be as precise or exact as the controls in Europe. You may find that when you return with your Diamond Ring, it may appear to be as good as the ones on display, but may not be worth any more than you paid. Or it might be worth less. If your Diamond is accompanied by a Certificate, make sure it is one that you can rely on.EGL European Gemological Laboratory, or GIA Gemological Institute of America, adhere to strict guidelines when it comes to grading. A certificate from the store you bought it from abroad is not sufficient. A lot of people are taking advantage of the Diamond district in Antwerp, and a lot of information about this can be found on the Internet. Again do your homework. The cost of flying over and back will contribute to the overall cost of purchase. This is something to consider. It is an approach that will save you some money, just make sure you include all costs. It is a more secure method if you wish to buy abroad. What type of metal should I have my Ring made from? Again, what would you like it made from. Gold, or Platinum? Gold is Gold, there is no difference in Yellow, Rose or White Gold save the metals introduced along with the Gold to give it its colour. Traditionally it is 18K which is 75% Gold and 25% Metals, and 14K which is 58.3% Gold and 41.7% Metals. Platinum is a different Metal. Pure yellow gold is actually very soft – too soft to be used in jewellery on its own, so it is usually combined with other metals, or alloys, to make it stronger and harder-wearing. Typical alloys include copper, zinc and nickel. Yellow Gold is available in different tones and the exact yellow hue depends on the type of metal alloys used and the percentage of each of them. Pure gold is a rich, shining yellow, full of lustre. 18K gold is also an intense yellow but 14K gold may be a little muted in tone compared to 18K because of the higher percentages of metal alloys which dilute the brilliant gold colour somewhat. White Gold is actually yellow gold which has been combined with a white metal such as palladium or nickel to give it a white hue. White gold, if left uncoated, will usually lack lustre and shine because of the metal alloy. The natural colour of white gold is actually a light grey. Generally, white gold is coated with a very thin layer of rhodium to give it greater depth of colour and shine. Platinum is a very scarce metal, thirty-five times rarer in nature than gold. The platinum used in jewellery is 95% pure platinum combined with 5% of other metals. Since platinum is such a hard metal, it will not wear down and jewellery made from it will retain the same shape for a lifetime. Platinum is heavier than gold and appreciated by those who like the feel of heavier, more substantial jewellery which does not look weighty. Platinum is naturally white and will not fade or change colour. However, platinum jewellery will naturally acquire a patina – a special sheen – from daily wear. Some people prefer the patina look, but others prefer to have their platinum jewellery professionally re-polished from time to time. So can I save money? Again this is relative to your choice of stone, and work you want done. But if you do your homework, then yes you can. Avoid the cheap alternatives. Across the board you should be able to save 30%. I have the privilege of dealing directly with brokers, and utilising some of the best Goldsmiths in the Country. Savings of somewhere between 30% and 50% can be achieved. Top of my priority however is advice. What to look for and how to look for it. I have been supplying Diamonds and Coloured Stones for a number of years, and I have found that it is this approach that has worked the best. You can get as creative as you want, design what you like, and see it come to fruition. Just like a marriage it is a growing process. I take delight in developing a relationship with my clients, offering advice foremost, and guiding them through the whole process. So, when picking your stone, pick one with a very good cut. You will be surprised with how much you will notice the difference after comparing stones. Do try as many options as you like. See what shape compliments your taste and hand. This could be a single stone, Solitaire, or a 3 Stone, or Multi stone Ring. Try them all. Have fun. If you are buying from a Jeweller you have their reputation to rely on. If you are buying your stones from a broker, seek Certification. Any stone over 0.50cts with top colour and clarity should be accompanied by an appropriate certificate. So the Steps in a Nutshell. First of all, before you do anything else, figure out what your budget is. You can buy a diamond engagement ring costing anywhere from a few hundred euro to upwards of tens of thousands. Pick a ballpark figure to begin with. You may find that you will want to adjust it as you do your research and discover possibilities which are just beyond your budget but worth the stretch for a much better deal. 2. Decide on the Centre Stone. A diamond is the traditional centre stone for an engagement ring, but sapphires of various colours, emeralds, and rubies are popular choices too. Once you decide on the type of stone you want, you’ll need to decide on the shape you prefer, too. If you’re interested in a Diamond, you’ll want to refer to the 4Cs. There are endless engagement ring settings to choose from, including solitaire settings, three-stone and multi-stone settings. Sometimes, the setting you choose will be influenced by your lifestyle. Is it going to be set in Gold, Platinum or a combination of both? 4. Design Your Own Engagement Ring. This isn’t compulsory, but it’s a tempting possibility. If you don’t fall in love with any of the engagement rings you have seen, then as mentioned earlier consider designing your own. It’s really very easy, and you’ll get exactly the design you’ve always dreamed of. We all know that getting married is a costly business and the wedding budget is a thorn in the side of most blushing brides to be. If you have poured over your budget on numerous occasions you might have thought about doing your own tan to save some of your hard-earned cash. Previously I would have said “down with that sort of thing”, your wedding day is not for experimenting or taking chances but I recently discovered a new faux tan that has changed my opinion. KARORA is a new eco chic tan that has been taking the beauty industry by storm. I was instantly impressed with this tan, it was so natural, I really did look like I had just come back from Marbella – if only! First impressions of Karora was the smell. It smells like sunbed cream, I LOVE this smell and smell is a very important factor on your wedding day believe it or not. I’m always a little wary trying out new tans so I applied this very sparingly and a little really does go a long way. Application was easy enough, just spray on a mitt and rub on to skin using a circular motion. There is a guide colour. I was immediately impressed with how quickly it dried and the fact that it was not sticky at all. I could easily have put my clothes back on 10 minutes after applying, if even! My light application gave me a perfect sun kissed glow. It lasted a good 9-10 days without me moisturising every day and faded really well with no streaks so this would be great for the first week of your honeymoon while you are waiting on your real tan to take shape. 4. When applying your self-tan, map out the body in stages so you don’t miss bits. Slowly work from the top of the body down to your feet. To avoid clogging pores on your face – a good tip is to run cold water over the face to ensure pores are closed and then pat dry. 6. Moisturise daily to prolong the life of your tan. To top up your tan try KARORA Gradual Bronzing Moisturiser with SPF15 rrp€19.99 on the face and body – gives a colour boost and skin protecting glow;KARORA’s botanical tanning products are priced from €14.99-€24.99. KARORA’s botanical bronzing in-salon treatment available from select salons nationwide and KARORA products available from pharmacies nationwide. Shop online at W: karoracosmetics.com or call 01-9022333 for stockist enquiries. We all know brides are radiant but that is with good reason. As well as your natural “I’m the happiest girl in the world” glow, this is probably the one time in your life where you will put the most effort into your beauty regime. So enjoy taking care of yourself and if you need some guidance of when and where to start then we have compiled a beauty countdown for you. This is not the time for experimenting or chopping and changing between hairdressers. Do some research and get some recommendations for a good stylist. Once you have found your stylist explain that you are getting married in 6 months and what kind of bridal style you are interested in. Together the two of you can come up with a hair care plan to follow over the coming months. Again, do your research. Request references and ask to see photos of recent work. A good make up artist who is confident in their work will not charge you for a make up trial. Blemishes, acne scars and other skin problems can all be resolved if you begin a regimen now. To improve your complexion, consider monthly facials and treatments like fruit-acid peels, which refresh skin’s outer layer. Microdermabrasion, a form of exfoliation that uses tiny crystals, is better for sensitive skin or a glycollic peel. Many salons now offer special offers for these treatments on certain days or a discount if you book a course. Be it bingo wings or that spare tyre that is bothering you now is the time to get serious and attack that target area. If you think about, 3 months of sit ups and bicep curls are not that bad really……. Research is important here again. You will be amazed what a difference a good brow shape makes to your face. Personally I think you can’t go wrong with benefit brow bars. Go for follow-ups every three weeks. Visit the hygenist at your local dentist for a teeth cleaning. If you are in the mood to splash then perhaps a professional teeth whitening session is on your list. We do not advise home teeth whitening treatments as they have been proven to damage the enamel on your teeth. Look after your teeth from here on in. If there is one thing that is a given on your wedding day that is the fact that you will be smiling from ear to ear. Do a trial run of both your hair and make up so you can see them together. Then hit the town, no point sitting at home all dolled up with nowhere to go. Cut your hair two weeks in advance so it won’t look too blunt. Have colour touched up now as well to give it time to settle in. Make an appointment to have your eyebrows shaped and other areas, like bikini line and legs, waxed. This way, there’s enough time for any redness to fade. Maybe you might fancy treating your husband to be with a brazilian? Make sure a take two Panadol 1 hour before the treatment if you do. Fill a cosmetics bag with supplies: tissues, a nail file, breath mints, and hair pins. Ask your makeup artist for powder, lipstick, and concealer to put in a custom makeup palette. Also, bring your nail polish for quick fixes. Get a manicure and pedicure a day ahead so nails can thoroughly dry. Should you nick or smudge a nail, gently even out the area with a buffer and smooth on a dot of color. “The buildup of oils overnight makes hair easier to work with the next day. We advise having this professionally applied. The more at ease your mind and body are, the better you’ll look. Stress can show up on your skin in the form of acne or eczema. To help stay calm, take slow, deep breaths, inhaling through the nose and exhaling through the mouth. Allow ample time for hair and makeup: Three hours before is when many brides begin their hair, followed by makeup, with each taking around an hour. Pull on your dress only after hair, makeup, and perfume are set (oils in fragrance can discolor your dress). Lastly, arrange hair accessories and veil. The couple who began dating in 2007 secretly wed in July 2010 and later announced that Miranda was 4 months pregnant. Pictures of the big day have yet to be seen. Little Britain Star David Walliams married Vogue Cover Girl Lara Stone in a lavish ceremony in May 2010. The bride wore a givenchy corsetted dress in ivory washed silk satin. They were joined by a host of celebrities such as Matt Lucas and James Corden. In June 2010 24 year old Megan Fox wed Brian Austin Green on a beautiful beach in Hawaii. The couple were joined by Brian’s son Kassius.Megan and Brian had been dating for six years on and off before tying the knot. In the same manner as Megan Fox and Brian Austin Green seemed to get married without anyone noticing, so did Penelope Cruz and Javier Bardem. Cruz, 36, and Bardem, 41, married in a small, private wedding ceremony in July 2010 at a friend’s home in the Bahamas.Cruz wore a gown designed by designer/ friend John Galliano. We are rating this one slightly on the low side simply because there are no pics! After an abundance of wedding-planning rumors Katy Perry and Russell Brand tied the knot in October 2010 in a fairy-tale ceremony in India at the Aman-i-Khas resort in the countryside of northern India. The celebration lasted six days, starting with a Bollywood-themed party and culminating in a ceremony that included 21 camels, horses and elephants! After the ceremony, the two both took to their Twitter pages to announce their new status. Long Term Bachelor Robbie Williams married Ayda Field in front of 75 family members and friends during a romantic ceremony at Mulholland Estates in Beverly Hills, Calif. Guests were treated to a sunset reception with champagne and gourmet hors d’ouvres after a brief ceremony and exchange of vows. 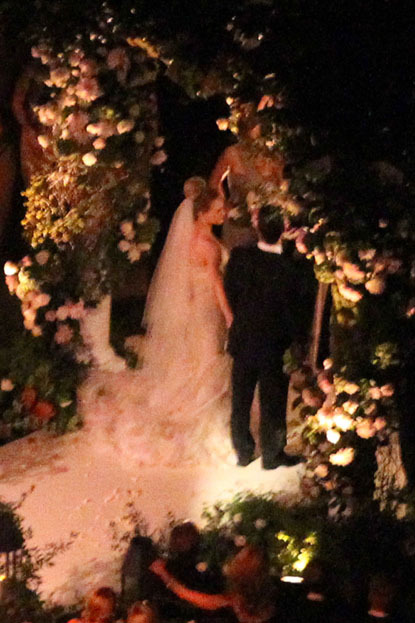 Hilary Duff tied the knot in a Vera Wang gown in front of 100 guests in August 2010. Longtime couple Nicole Richie and Joel Madden decided to end 2010 with a bang—by tying the knot at Lionel Richie’s Southern California estate. After being escorted down the aisle by her famous father, Nicole and the Good Charlotte frontman were officially wed by a very special minister: the Reverend Run, the Run-DMC rapper and reality-TV star! The winter-themed wedding, which featured the couple’s daughter, Harlow, as the gorgeous flower girl, had a guest list of about 130, which included Khloé Kardashian, Samantha Ronson and an elephant for good luck! 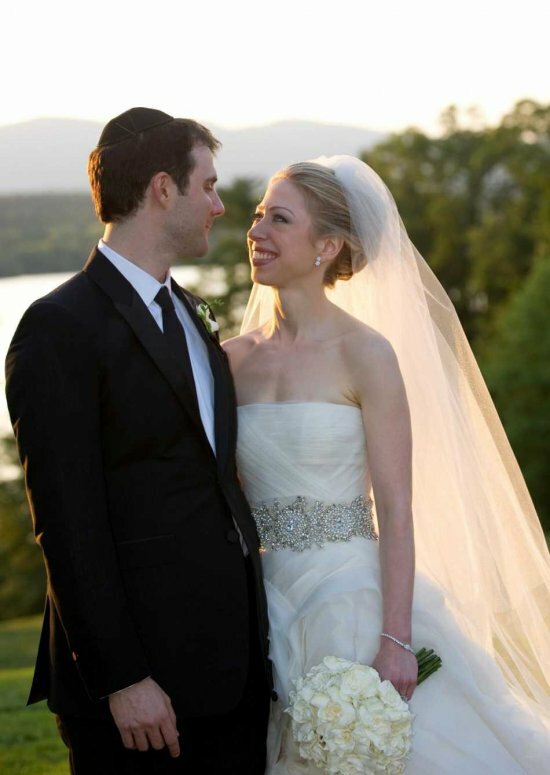 In a wedding ceremony that was rumoured to have cost 2 million dollars, Chelsea Clinton tied the know in July 2010 in a Very Wang Strapless Gown. Who better to top the number one spot than our very own “Bramy”! Actress Amy Huberman married Rugby Star Brian O Driscoll Dubbed at St Joseph’s Church, Aughavas and attended a private reception later in Lough Rynn Castle Hotel, Mohill, on July 2nd 2010. The ladies of Ireland oohhed and awwed over Amy’s stunning choice of gown. Amy chose to wear a classic fairytale inspired gown by Irish Designer Stephanie Allin and the bridesmaids also wore irish designs by Fee G.
The couple were so down to earth that Brian even arrived early to greet & sign autographs for the waiting specators. Altogether now awwww. After Cruise declared his love for the much younger Holmes on Oprah’s couch, the duo got hitched in an Italian castle. Among the A-list guests who attended the $2 million wedding were Victoria and David Beckham, and Will Smith and Jada Pinkett. Holmes wore Armani. Hitched at Castle Leslie in Monaghan, Ireland, in a ceremony that cost upward of $3 million, $40,000 was spent on the wedding gown alone. The style icon wore a gorgeous silk and lace dress designed by MGM’s Helen Rose, ushering in the trend of full, feminie wedding dresses. Arguably the most stylish First Lady of all time, Jackie Kennedy’s wedding dress – designed by Anne Lowe – has become the most photographed in American history. Taylor’s eigth marriage was held at Michael Jackson’s 2,700-acre Neverland Ranch. Taylor wore Valentino when she wed Fortensky, 20 years her junior.